Opinion (Sergei Mats, psychologist, filmmaker, lecturer at the Institute of Psychology of Russian University for the Humanities in Moscow): “Do feelings deceive you? – Don’t worry, they have been designed mostly for this. Each of us lives in his own individual surrounding world. This world is filled with personal feelings. “This reality contains optical illusions, strange noises, little understood sensations and smells, pseudo hallucinations (cinema, computer monitor). “People absolutely realistically see, hear and feel things that did not and could not exist. You are looking at a white cloth, illuminated by a projector, or a panel, consisting of RGB- triads, and it definitely seems to you that there occur the events that make you laugh and cry. “Similarly, many experienced psychic phenomena; they actually ‘saw,’ ‘felt, and ‘heard voices”; for them they are all true, ’another reality’ that leaves no reason for doubts. “Sometimes, someone’s life may depend on the complex psychological nature of human emotions. With what degree of truth can one assert that the witness really saw and heard everything that seemed to him to be seen and heard without doubts? My Comment: Our development proceeds along two lines so that we, (1) as a result of our development, (2) discover its complete inadequacy. It is this frustration that will enable us to (3) realize and accept a whole new way of development, opposite to the first one (1), to development towards unity, in which we will reveal a new sense organ and through it will start our existence in a new, higher world. Reality Or Life Among Images? Sin is a state of being submerged in the ego. If I am closer to myself than to someone else it is already a sin. Therefore it is usually difficult not to sin. So we must correct the desire in which I want to enjoy before I delight others. This is called an offering (Korban), which in Hebrew stems from the root “getting closer” (Karov) bringing our desire closer to the attribute of bestowal. An offering is the part of my ego I can sacrifice in order to bestow unto others and to love them. Our role and the role of humanity is to perceive, to understand, and to feel that the ego is bad, because there is nothing other than that. But we refer to the ego that doesn’t allow us to connect with others and not the personal inclinations and calculations every person has, which have nothing to do with the Torah. The Torah is the gathering of the desires around Mt. Sinai, around the mutual hatred we feel towards one another, that starts from a small thing, from my being closer to myself than to you. Everything comes down to the revelation in the egoism. The formula is very simple: “I have created an evil inclination, I have created the Torah as a spice,” since the Light in it reforms. It is because the Light of the Torah brings us back to the source, to the Creator, to the attribute of bestowal and love. What Is Sin In Kabbalah? Question: Did Baal HaSulam leave us information about all the stages on the way so that it will be possible to create the method on the basis of this information? Answer: No, Baal HaSulam didn’t leave us with information like this. We need to find the way ourselves. The path seems clear, but how to advance on it from stage to stage is what nobody knows. The problem is that we have to go out on this path without any guarantee, any knowledge, but only by realizing the need and having no choice. The world pressures us, meaning that the Creator pressures us through the world, and we must bring people to connection so that through it they will attain the equivalence of form with the Creator. The moment we begin the right search through our connection with friends, we begin to discover the method. This is because it is imperative for us and is expressed in our words, our manner and style, with all of our conditions. No Kabbalist until our day could write anything about this. The wisdom of Kabbalah is a practical science that was conceived through experience, through experiment. And someone who is not living in our time didn’t know and wouldn’t know even if he were a great Kabbalist. He could talk about general tendencies, about two ways, but he could not write more about our time. That’s why the Kabbalists were deployed in each and every generation, and now we find ourselves in our times. In the writings of Baal HaSulam, it is possible to find some hints about our time. There is something mentioned in the writings of The Last Generation, but it is impossible to copy blindly from there. One may discover that he is trying to draw into the present reality something that will be realized after many years and which in the meantime, is of little importance. 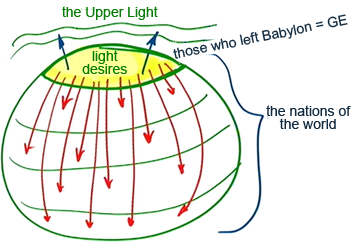 The entire great Kli of the soul was shattered into fragments, and among the fragments are pure Kelim (vessels) that are close to the characteristics of the upper Light. It is very easy for them to be awakened, so when Abraham called to them, they were immediately awakened, got up, and followed him, leaving Babylon. This is Israel, which only seems to be the most egoistic part in the world because it has already gone through the path of spiritual development. But essentially, this is a very refined Kli (vessel) and belongs to the Kelim of Galgalta ve Eynaim (GE). Every remaining part of the collective Kli belongs to the nations of the world, and specifically through their correction, we attain Ohr Hochma (Light of Wisdom). They are the goal of creation, whereas Israel acts only as a help in this realization, in the role of an adaptor, a conduit. Question: It follows that the Creator chose these refined Kelim as sacrifices? Answer: On the one hand, we are sacrifices, but on the other hand, Israel is a unique nation that serves all the others. Everything depends on how you accept this honored mission: Do you think and receive your service to the Creator and to the world as a respectable merit or as a punishment? You came into this world to serve all the nations of the world and through this to serve the Creator. These are the refined Kelim that are awakened first and have the readiness to connect. They have an initial preparation for correction because they have the “merit of the forefathers,” meaning that they have already passed through spiritual states that were latent in them in a concealed form and they can be awakened again. All this is done to be a light to the nations, so that in them the thought of creation will be realized. The goal is to reach all the heaviest Kelim. They are called “the chosen people” because they have a unique role. Israel is in the service of the Creator and the creatures, and we are in the middle as a conduit, as a pipe. And it is essential to accept this mission when it is necessary, otherwise you will always be obligated from Above. There is no reason to argue with the program of creation; the more rapidly that Israel understands what must be done, it will be to our benefit and the benefit of others and there will be less suffering. A person who yearns to discover the true world, who wants to know for what and why he is living on the face of this earth and what is happening here in general, sees himself as an investigator who learns about the world in order to understand and to feel it. But in fact, this is not the right approach, because in the center of the world, the higher power is found and not us. It moves and determines everything. And if we want to investigate the world, then we must always adhere to that higher power. In order to truly discover the picture of the world, it is necessary, first of all, to see this source of all of reality and all that happens within it. I must know that everything is derived from a single power. And all creatures, including myself, the still, vegetative, animate, and humans, everything that exists in this world, what we know and what is still unknown, is received from this higher source. I must concentrate my attention specifically on that, on the Creator. This means that all the events that happen with me and with others, all of our feelings, all of the past, present, and future—everything comes from the Creator and for only one purpose, to bring us to Him. But so all of us will come to Him, it is necessary to receive all kinds of observations from Him; it is not important whether they are negative or positive. We need to be always be between these experiences and observations, and so time after time we learn about Him more and more. These stages of our advancement towards the Creator are called “five worlds” (Olamot), which comes from the word “Alama (concealment)”: Assiya, Yetzira, Beria, Atzilut, Adam Kadmon, after which comes the world of Infinity where we merge with the Creator as a single whole. So step after step we approach Him, let’s say 20% with every stage, until we reach one hundred percent resemblance and equivalence to, understanding and perception of the Creator. If follows that I don’t ascribe all of the internal feelings of our body and personal experiences to those people around me who seemingly cause them, but instead to the Creator. All of the people, the whole world, including my body and myself, are moved by Him. So I only need to know how to relate correctly to all that is happening: First of all, remember that everything comes from the Creator; second, it comes to teach me to understand Him. This means that I must draw conclusions from all these states through which I am passing and see a good sign in what I now feel. This is because the Creator didn’t create anything bad and if I am directed towards Him, then I cannot feel anything bad. But if I am directed in some other direction, then it will be bad for me. As I continually follow, like radar, this view of the world and everything that is happening, I absorb the attitude of the Creator, meaning that I see that everything is coming from Him to direct me towards Him and only with what is good. So it is written: (Psalms 97:10), O ye that love the LORD, hate evil. We begin to discover that when we are aimed in the right direction, towards the Creator, then everything that opposes bestowal is discovered as evil. This is because being directed towards Him requires us to be like Him. This is what we must learn during every second of our lives. It is impossible to direct myself towards the Creator alone because I am compelled to go out of my ego. And so I must be connected with other people. It is desirable that we have ten people. If we unite together to find the Creator, then we begin to see that only through the disengagement of each one from himself and disappearance into our connection can we abandon our old vision and focus on the Creator. This is like stereo pictures that look like a chaotic drawing with lots of lines. But if we look at this picture with unfocused eyes, then we begin to see all kinds of images in the depth of the picture. That is also how we need to disengage from our egoistic view of the world, which is typical of everyone’e nature. In this vision, we lock ourselves artificially in a very limited world, and to leave it, we need to open our senses. This is possible only by creating a new focus. It is necessary to see the world, not with our egoistic eyes, but with the eyes of the group, and then a new focus appears in all directions. 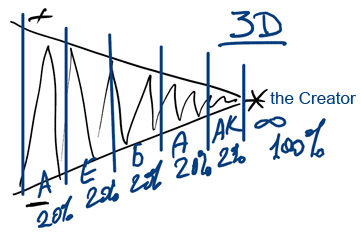 Thus we enter, not a three-dimensional world, but a world of infinite dimensions, where in every direction and passes some plane coordinate axes. If I want to advance correctly, first of all I need to act through the group. There is no other mechanism for nullifying the focus of my vision and directing it spiritually. Only through the group can I try to feel something spiritual. If I feel the world through the group, this is a sign that I have focused on the spiritual world, similar to the efforts to see the stereo picture. The main thing is to discern that everything comes from the Creator to teach me to understand Him. The world is His language with which He speaks to me. Someone screams at me and there’s a set of events that takes place at every moment, while I must try to understand what the Creator wants it to tell me, what kind of reaction is required from me towards Him. This means that first of all I must understand that this comes from Him. After that, I decide how I must react to what is happening. The reaction must be such that through what the Creator said to me and my desire to answer Him from within, between us we become closer, meaning that I understood Him and I did what He expected from me. And then with everyone, I will behave exactly in this form: with the children, in the family, with people near and far. The clarification of my attitude towards the Creator, the reception of information from Him and responding to it, is called intention. And after that there can be action. We must be involved with this at every moment in our lives. A person’s self doesn’t disappear, but actually keeps on growing in a form suitable to the Creator. It says that a person is like the Creator’s shadow that repeats all the Creator’s actions. But by such actions, a person doesn’t become a shadow that has no desire. Even if everything is predetermined by the Creator, it doesn’t erase me, my free will. It is because I have clarified it by myself, and I have built myself to resemble the Creator by myself, and so I am equal to Him in height. This is actually the Creator’s desire: that I will be a human being, Adam, that resembles Him, and that the two great Lights Zeir Anpin and Malchut will be equal in height. What Is Seen In The Next Photograph? Baal HaSulam, Shamati #1 “There is None Else Besides Him”: It is written, “there is none else besides Him.” This means that there is no other force in the world that has the ability to do anything against Him. And what man sees, that there are things in the world that deny the Higher Household, the solitary source, the reason is that this is His will. The Creator wants to give us the feeling that supposedly there are other forces and sources of influence existing in the world: the person himself and many other people. And it is deemed a correction, called the left rejects and the right adducts, two forms of higher supervision for teaching a person. Meaning that which the left rejects is considered correction. This means that there are things in the world, which, to begin with, aim to divert a person from the right way, and by which he is rejected from Sanctity, from connection with the Creator. And the benefit from the rejections is that through them a person receives a need and a complete desire for the Creator to help him, because he sees that by himself he cannot hold the right picture of reality. Since he sees that otherwise he is lost, it will be gone, he is lost in this world. Not only does he not progress in his work, but he sees that he regresses. It constantly becomes more and more difficult for us to keep the connection with the Creator. And so many abandon this way; they think that they may not be suitable for it or that the way itself is not right and leads to an unattainable goal. We don’t understand that the difficulties are given to us intentionally. It is good that we don’t succeed! For then we feel a need for the Creator and begin to approach Him, and don’t just cleverly overcome some kind of task. The Creator intentionally gives us more and more difficult tasks that cannot be carried out so that we will ask for His help; we will want to approach Him and not struggle with the difficulties by ourselves. Before we were able to adhere to the Creator, we try to understand and feel what is happening in life. In the beginning everyone burns with excitement and is full of energy. But after this, we gradually cool off and begin to see that it is not easy. And the main thing is to understand at the same time that this is a natural process. We don’t advance egoistically from one success to a greater success. Specifically the lack of success in perceiving reality, in understanding the world, is a good sign. It shows that we see how much we are not ready to get along by ourselves and we need the help of the Creator. The main thing here is not to flee but to continue to advance. If a person doesn’t judge what is happening according to his earthly intellect but perceives correctly, then he understands that disappointment, despair, confusion, and lack of success are sent by a higher power, that there is none else besides Him. Then he comes to the decision that no one can help him but the Creator Himself. This causes him to make a heartfelt demand that the Creator will open his eyes and heart, and truly bring him nearer to eternal adhesion with God. This means that he demands to approach and adhere to the higher power itself and not the solution to his material problems. He doesn’t want to change and understand the world; rather, he wants to connect with the Creator through it. It thus follows, that all the rejections he had experienced had come from the Creator. This means that it was not because he was at fault. Precisely because the Creator doesn’t give the possibility of advancing, apparently confuses, rejects, and creates disturbances, He presents help to a person by showing him his deficiencies in his present state by sending him thoughts and arguments that are against spiritual work. And this is all so that the person will see that what he lacks is union with the Creator, and not prosperity in this world. And as much as he overcomes, he always sees how he is farther from holiness than others. He looks at the friends and sees that they all seemingly advance, while he doesn’t. But he, on the other hand, always has complaints and demands, and he cannot justify the Creator’s behavior, and how He behaves toward him. This pains him. Why is he not one with the Creator? Finally, he comes to feel that he has no part in holiness whatsoever… However, this is what causes him to come to realize that only God can help and really bring him closer.